Where does Tucson get its water? Hi all. As I was riding my bike to school avoiding all the puddles, I was thinking about where the water we drink in Tucson comes from. If you think about it, we don’t have any flowing rivers (for all of you not from Tucson, we have “washes,” which are dry river beds that flood every so often during a large rain event – image to the right), but when we turn on our taps, water flows out. So where do we get our water? Rillito River, Tucson, AZ. Courtesy of http://www.tucsonazrealestateblog.com/tucson-real-estate/. 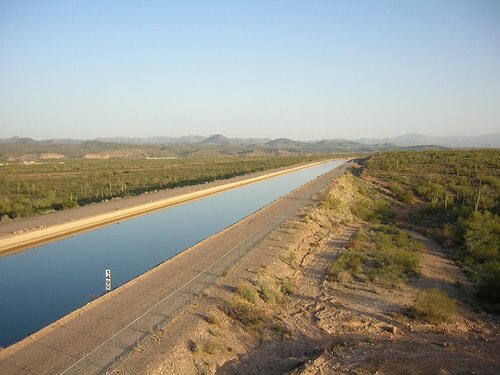 Historically, Tucson has pumped water from the regional aquifer (sediments below the surface that are saturated with water – like a sponge); while our population was small, this was a renewable source of water via rainfall percolating down to the aquifer. As Tucson’s population began to rise, with it the need for water, we started to overpump, or mine, our aquifer. This lead to lowered water tables, higher costs for water, and a bleak outlook for the future of Tucson and its water needs. 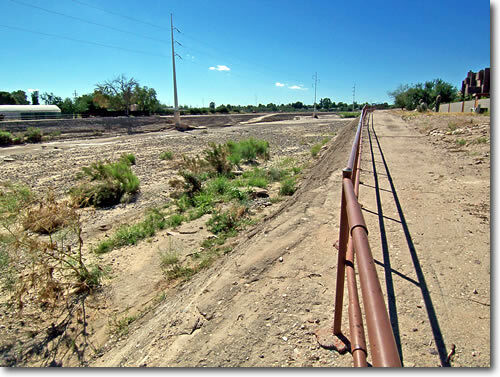 In 2001, Tucson began to mix Colorado River water brought down south via the CAP (Central Arizona Project – which is a canal that brings Colorado River water from northern Arizona to southern Arizona). Mixing the water with groundwater allowed the water utility to recharge some of the aquifer with CAP water. Adding CAP water to the mix has allowed the water utility to shut down some pumping wells and as a result the water table has risen in some places. If you’re interested in learning more about what Tucson’s water plan, please follow this link for more information: http://www.ci.tucson.az.us/water/waterplan.htm. 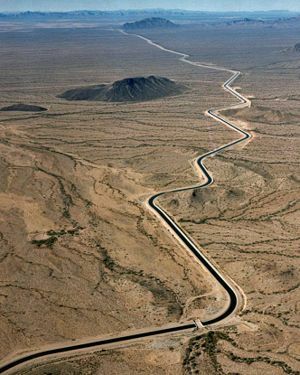 Central Arizona Project (CAP): Brings billions of gallons of Colorado River water to southern Arizona each year. However, the population of Tucson has continued to increase and we only have access to a set amount of CAP water, 40 billion gallons of water each year to be exact. We only use about 22 billion gallons per year currently, but with people moving to Tucson for the sun and the golf, we will exceed our allocation of CAP water in the near future. This means that we’ll have a “water problem” again with no clear solution in sight. So what can we do? Well there are a few things we can do to help our water situation. (1) Water Conservation: The less water we use the less water Tucson needs to use as a city. We can put in native vegetation in our yards that need minimal watering or no watering (just imagine never having the mow your lawn again…). Shut off the tap when we brush our teeth and shave, take showers rather than baths, only wash our cars once in a while rather than every weekend. Making simple changes will help conserve millions of gallons of water each year, and lower your water bill at the same time. (2) Reuse Water: Reusing water that we’ve used for clothes washing may seem a little weird, but water your garden with washing machine water (sometimes called “gray water”) can save a lot of water in the long run. Besides, your plants don’t care what kind of water they get; it’s pretty much all the same to them. 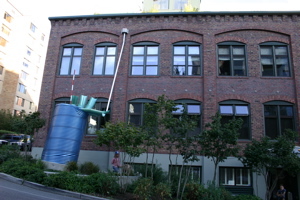 Here’s an example of gray water reuse: http://www.builditsolar.com/Projects/Water/Water.htm. (3) Rainwater Harvesting: Now this sounds a little hippyish, but rainwater harvesting is big business in Tucson. Saving rainwater in cisterns to water your yard is easy and cheap (i.e. free, if your subtract the cost of the cistern). Go to this link for more info: http://www.builditsolar.com/Projects/Water/Water.htm, http://www.harvestingrainwater.com/rainwater-harvesting-inforesources/. Water is a precious and limited resource, if we all make small changes in our lives, we will have a large impact on conserving this vital resource for the future. I know, I know, It’s been a while since my last posting, but I really have an excuse – I’ve switched graduate programs and am fixing to be a environmental engineering graduate student come January 13th. I’m looking forward to a change in pace, a different project, and the math!! I’ve always been attracted to applied science (i.e. how can science help everyday people, such as biomedical engineering, waste water treatment design, etc.) and I think this will be a better fit for me. Well enough about me, I wanted to talk about ground water today. Now most people that I talk to have heard of the term groundwater, they associate it with a well and water that’s clean (with a bit of a funny aftertaste is some cases). I remember once that co-worker of mine thought that groundwater is just underground rivers flowing in caves. There are caves that have underground rivers flowing, but this is by far the least common form of ground water. So let’s take a scientific look at what groundwater is. What do we know? First, we know that when it rains, not all water evaporates or flows over the land into rivers, some does, but not all of it. Second, we know that springs are found in peculiar spots. Third, we know that we can get water if we drill a well. So where does the water go if it doesn’t all evaporate or flow into rivers? – If you take a look at dirt, you notice that it’s composed of small grains of clay, silt and sand. If you pour water on the ground, it wicks away into the ground like water into a sponge. The spaces in between the clay, silt and sand particles create voids, and these voids go all the way down into the ground until they hit bedrock. These voids are called porosity, or the volume that can be occupied by either air or water. I know that it doesn’t look like it, but a soil’s porosity can be a lot. For example, a gravel soil may have up 25% porosity, or 25% of the total volume is empty, a sandy soil can be 35% porosity, and a clay soil can be up to 70% porosity!! Now you may notice that if you try to squeeze a handful of wet sand, water come out, but when you squeeze a handful of clay mud, it just remains sticky. This brings me to another term – permeability. permeability is the connectedness of each pore to each other. Think of a Styrofoam cup, if you cut it open and look closely at it, you’ll notice that it’s composed of lots of small air pockets. A Styrofoam cup may have 95% porosity, but because those pores aren’t connected, they have zero permeability. That’s why your hot coffee doesn’t seep through the cup and burn your hand. So what’s a spring? Well, as water percolates through the soil, it’ll eventually reach an area of the soil where it’s saturated, like a saturated sponge. Here it forms a boundary between saturated and unsaturated soil – this is called a water table, and everything below is called an aquifer. The water table moves up and down with the seasons and from pumping the aquifer. The water table generally follows the landscape topography, so when we get a steep hill, and the water table hits the surface, we get a spring. So what are pumping from a well? A well is just a straw that we drill into the ground to access the groundwater. You can imagine that a well is made up of a long tube that has a lot of tiny slits cut into it where we find good water called a screen. It’s from this screened area that we pump water. In developing countries, they usually dig the well by hand and line it with stones, then use well bags to draw the water up. So why do some wells dry up? If the water table drops below the screened area, then all we’re pumping is air in the pore space. This can happen due to drought or more commonly due to over pumping the aquifer. Waste Water Treatment Plants: One of The Greatest Public Health Inventions, Ever. Many of us don’t even think about what happens when we flush the toilet or turn on the garbage disposal and wash our dinner scraps down the sink, but the invention of waste water treatment has made our lives healthier by removing unhealthy microbes from where we live. Just imagine how hard life would be if we were always concerned about cholera, dysentery, typhoid fever, or giardiasis. These are real problems in much of the developing world, and many places only wish they had waste water treatment facilities like we have in every city in the US. Interestingly, modern waste water treatment technology is not that old and in Tucson, our modern facility was only installed in the late 70’s. Before 1900, Tucson didn’t have a sewer system. From 1900 to the early 1950’s raw sewage was shipped away from the city and used for irrigation. A modern waste water treatment center was built in 1951 and it has expanded ever since. The modern facility at Roger Rd. can handle 41 million gallons per day of raw sewage; 41 million gallons per day!! That’s a lot of waste. Secondary Treatment: The sludge from the primary treatment is sent to a system of honeycomb looking things called “Bio-Towers.” Here the waste stream “trickles” down the honeycomb to “filter out” and convert all of the biosolids (organic wastes) from the sludge to food for microbes that cover the honeycomb. This is called a “trickling filter” for obvious reasons. This is also where most of the waste water treatment occurs. The waste stream is sent to another tank that is pumped full of oxygen and where microbes break down the rest of the organics. The last stage of waste water treatment is to add chlorine to the water to kill any residual microbes and then it’s released to the Santa Cruz River. Although this water has been treated and is released to the environment, it’s not a good idea to swim in or drink this water. That’s it. Without microbes using our wastes as food, we’d be swimming, literally, in our own sewage. The science of microbiology has made our lives much healthier. You might be wondering what happens to all of the solid sludge that is a product of treatment. Well, it’s applied to cotton fields as fertilizer; don’t worry, it’s not used on any crops we eat. Recently, I’ve been asked by several people if we’re going to be drinking treated waste water in the future in Tucson (often called toilet-to-tap). I’ve heard many things about this and it’s not conclusive either way. What is certain is that we currently use treated waste water for irrigation at 90% of our golf courses here in Tucson. This is a great use for this water, because drinking water is expensive and there’s no benefit to spraying it out on our golf courses to grow grass. In the desert, water is a very valuable resource and it’s always a good idea to conserve it where we can. One solution that the city of Marana is exploring is to use a “duel delivery system.” This is where treated waste water is sent to houses, separate from drinking water, to flush toilets, water lawns, etc. – uses that don’t need to be up to drinking water standards. This will hopefully cut costs to consumers and establish a tradition of reuse and recycling our water in Southern Arizona. So I was watching my favorite NFL team, the Denver Broncos, today take it to the Dallas Cowboys and I was thinking about bumper stickers I used to see in Denver – “If God wasn’t a Bronco fan, then why are sunsets orange?” Then I thought, why are sunsets orange? Living here in Tucson, we’re lucky to have spectacular sunsets nearly every night and one of the best places to see this is half-way up the Catalina Highway at the Windy Point pulloff – definitely worth the drive up there. Anyway, back to our question – why are sunsets orange? Well, after looking into this, it’s an effect that is due to the thickness of the atmosphere that sunlight passes through in the evening. At midday, sunight passes through the thinnest portion of atmosphere and the amount of light scattering is the least – sunlight is it’s brightest and it looks “white”. Now when the sun is setting, sunlight is hitting the atmosphere at an angle, passing through more atmosphere, and is scattered. Blue and green light is scattered while yellow, orange and red light is least scattered making the beautiful sunsets we see. I thought I’d use my first post to tell you about how the scientific endeavor can be fun. When I see scientists in the media or on TV sitcoms, they’re portrayed as nerdy social misfits that lack personality and couldn’t lift a pin cushion if they had to. Admittedly, there are scientists out there that are like this, however, there are a breed of scientists that enjoy the outdoors and live to do field work. You’ll occasionally see these types of scientists on NOVA specials about glacial floods and such, but did you know that a “natural scientist” does field work on a regular basis? This summer, I spent almost everyday out in the field north of Tucson, AZ collecting soils and building experimental plots and shelters. You might ask how working during the summer in the desert is at all fun – it’s hot, there’s lots of spiny cacti, snakes, and buzzards, etc., but you get used to the heat, drink a lot of water, and your schedule changes so that you start the day at 5AM and go until 10 or 11 AM. Plus, I used a four wheeler to get to my field sites a couple of times. The day that my field assistant, Mark, and I went out on the four wheeler was absolutely thrilling. We had to take the Charaleau Gap road (the top rated four-wheeling road in southern AZ) to one of my experimental sites. It got the adrenaline pumping to say the least. Anyway, I was able to hike all summer and I was able to get a lot of work done in the process. We build rainout shelters at 6 sites in the Catalina’s. These rainout shelters are designed to create drought conditions under the shelters – more about why I’m doing this in a later post. There are many scientific disciplines that get to do field work: ecology, geology, paleontology, archaeology, biology, etc., even social scientists get to go outside every once in a while. This is what makes a lot science fun, it’s not all lab work, and doing math (even though these are important aspects of science). For those of us out there that love to hike and spend our days outside, “natural sciences” allow us to mesh our hobbies with our work. What can be better than that? I’ll be posting science content here as a way to reach out and unveil some of the mystery about science. I work mainly in soils and with climate change, so these two subjects will probably dominate my blog, at least for the time being. I would also like to discuss what scientists do and how science is performed. I was out of science for a couple of years and I found that there’s a lot of misunderstanding about what science is, which I attribute to the total inability of scientists to explain what they actually do. I grew up surrounded by science; you could say that I come from a scientific family. Yet, stepping back and talking to non-scientists, I found that there are basic questions out there that people still have. I invite you to ask any questions you have about science, climate change, natural resources, or anything that crosses your mind and I’ll do my best to give you an informed answer. I look forward to the dialogue.